A party for every occasion! Free set up & pack down time. (At least 2 hours required before & 1 hour after event). Free professional planning from early planning to after completion of your event. 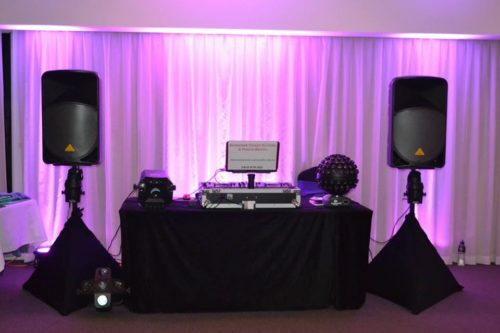 Free high quality LED dance lighting for all night time or indoor events anytime. Free travel from Postcode 4551 Caloundra up to 60km (covering Tewantin to Bribie Island & Maleny Hinterland radius). Free advice on how best to choose your music with music spreadsheet supplied to you to enter your must play music. Free meeting or meetings via landline phone conference to ensure smooth running of your event. Free face to face meeting in Caloundra before or after booking if needed or required. Free high qulity Shure wireless Microphone for speeches with back up corded microphone if needed. All events are covered with $10 million dollar public Liability insurance. UP to 8 LED up lights set to any colour your request to highlight the walls in your function room. These lights set the tone & colour scheme of your event. They require no power leads as they have a built in lithium battery lasting up to 20 hours. They can later be swithed to automatic to show a mixuure of colours or beat with the dance music. PRICE $150. Please see a demonstration on our Wedding page. A Spectacular cloud machine for the your event. This is amazing to have your guests dancing on a cloud to their special song during the highlight of your event. It is completely safe as it is a mixture of water, ice & heat to form a thick cloud. PRICE $200. Book both LED up lights & the cloud machine & save $50. TOTAL PRICE $300. Just choose the combination deal during the booking process & this will automatically be added to your booking.